This quest is a very easy one if it is not in Godlands. If it is in Godlands then it becomes extremely dangerous as it seems that more gods than normal crowd this area. If you have not taken out all 5 pillars in a 15 second time frame then pillars that you destroyed will be restored when the 15 seconds are expired. If you are not in a large group then the trick is to damage each pillar for only about 2 or 3 seconds, then move on to the next one. Keep doing this until they are all destroyed. Collect loot. Lately this quest lasts only a few seconds when in a crowded realm. To get a good chance on a loot drop you really have to get there first or have a melee and get your hits on as many pillars as possible. A melee is almost essential because of their higher DPS generally allowing soul bound. If this quest does not appear in Godlands then using the advice above for solo or if not solo just follow the crowd shooting each pillar as you come to it. If the quest is not in Godlands then just solo it or follow the crowd. If it is in Godlands then you will need to be very careful. Potted with Max DEF will help you here but you will have better luck as a 4/8 or better. You will have to be careful of all the other gods trying to kill you. Do some damage on a pillar, clear the gods away from it and move on to the next pillar. Rogue - Cloaking can help you tons if the area is infested with Gods. Mystic - If the area is swarming with Gods people will love having you around to stasis them. 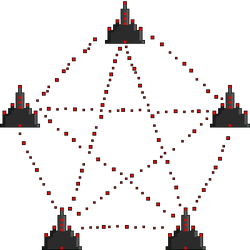 Ninja / Trickster - If no one is close to the Pentaract then having one of these guys rush to event almost guarantees you getting there first or close to it and getting your soul bound.